We've just been Boo'd, and have since Boo'd two neighbors, with two more coming up (we had too much fun to stop at just 2 as the neighborhood tradition stipulates...). The idea is pretty simple as a sort of Pay-It-Forward concept. Secretly leave a Halloween treat for a neighbor and encourage them (via a note) to Boo two more neighbors, thus spreading Halloween cheer. Last year I'd seen some papers taped to front doors throughout the neighborhood, and I didn't realize what they were. This year we were Boo'd ourselves so we know what it is all about now! I asked a friend at our son's school if she knew about Boo-ing, and she told me that their neighborhood has been doing it for over 10 years, and that almost every house in the whole neighborhood get's Boo'd! Let Miracle-Gro and their Gardenieres Help With Your Fall Projects! Our family works hard in the yard all Spring and Summer, but we don't really know what to do in Fall, so I was excited to see that Miracle-Gro® and the Gardenieres have started a website dedicated to providing videos for people like me, and they currently have some great videos for Fall. The Gardenieres have each been hand-picked by master gardener, William Moss. They are people who have real experience when it comes to gardens, plants and growing thing. They will be showing us gardening tips and tricks from across the entire country, so there will be plenty of great learning opporutnities, and it sounds like there may even be some opportunities to meet them online and in our neighborhoods. They are here to help us be more successful. One of the problem points in our yard is our roses. We have both rose bushes and climbers. When we manage to care for them they are beautiful, but more often than not they are leggy and need tlc. I just watched a video Gardeniere Gina did on Rose Bush Pruning and Rose Bush Training, which had some wonderful information on where and why to prune the bushes, as well as how to tame climbers. I was really impressed with the information Gina provided, such as the importance of pruning rose branches that are smaller in width than a pencil because they are pulling energy from the plant. She also showed how to prune the branches to encourage growth in a certain direction, so now I have a great place to start. I know one Fall project I'll be working on this weekend, especially now that I know how to prune those roses. I'm also going to look at the Find beauty in the Fall page and see what Fall edible plants I can plant in our yard. The kids and I had a blast growing a big garden this year, and I'd love to continue it a little longer. It is also a great time to add Tree Spikes to some of our trees and shrubs so they will get plant food all Fall and will stay healthy and strong. I encourage you to check out the great videos available. You can also visit Miracle-Gro® on their Miracle-Gro Facebook page. 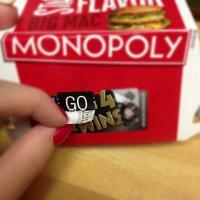 YES, It is Monopoly Game Time at McDonald's! This is their 20th Monopoly Game! 1 in 4 Wins and there are over 135,000 prizes this time. 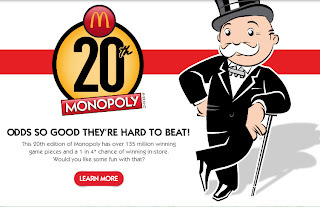 Game pieces come on Hashbrowns, Oatmeal, Egg McMuffins, Large McCafe Drinks, Medium McCafe Drinks, Filet-O-Fish, 10 AND 20 Piece McNuggets, Large Fries, Medium Drinks, and Big Macs. So far we've won fries and breakfast sandwiches... what have you won? 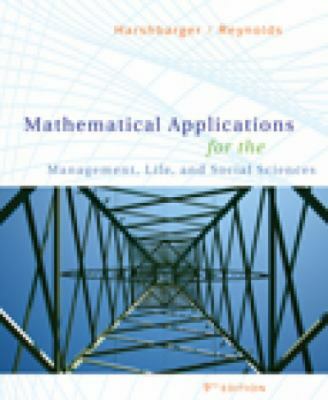 CampusBookRentals: Saves You Money And Supports Operation Smile! When I was in college, text book rentals were just being talked about, so I didn't have a chance to give it a try. Instead, I was LUCKY to find a used textbook (assuming the class didn't require a brand new edition), pay around $160 for it, then I'd be lucky to sell it back to the campus bookstore for $10. It was a lose-lose for me. This is where CampusBookRentals.com comes in. Students can now rent a book at a fraction of the cost. 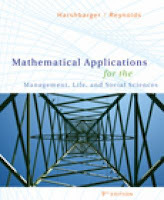 For example, if you look at this current Mathematical Applications book, the list price is $253.95, but you can rent it from CampusBookRentals.com for $12.14 for the quarter. Plus, if you want to get it early or keep it late, you can adjust the due date, and they send you a shipping envelope to return the book, so all you have to do is drop it in the mail when you are done! EASY! I wish I had been able to use CampusBookRentals when I was in college! I would have saved a bunch of money and felt good about my part in supporting Operation Smile. Disclosure: This is a sponsored post. My opinion is 100% my own, and I'm glad I am able to share this information with you. Happy Holidays!! It's that time of year again... time to start thinking of getting your yearly holiday card designed so you can get it sent out before the end of the year. I simply love getting photo holiday cards, and I love sending them because I can give a quick update on our family life to friends and family. Last year I spent a lot of time on our cards, from designing them (Shutterfly and Tiny Prints have some VERY helpful tools that help you customize EVERYTHING about your cards so you get them exactly how you want them... and in case you don't know, Shutterfly and Tiny Prints are part of the same company). It really is easy to design your own cards, and Shutterfly even helps you by giving you lots of different layout options on most of the cards. 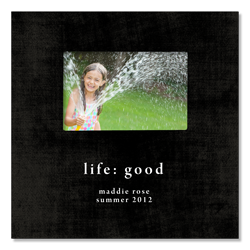 I encourage you to stop by their site and check out there great line of Holiday Cards. While you are there, check out there Special Offers and see what other great deals you can find. Giveaway Details: One lucky winner will get a $50 gift code to apply to your order. Entry is easy on the Rafflecopter form below. Disclosure: I will be receiving a promotional code to help pay for my holiday cards in exchange for sharing with you, I am also being provided with a $50 giveaway prize for one of you! I am excited to bring you a chance to win a $50 gift code to use on Rendi Style's Home Decor website. Their products are wonderful - you'll love them! Check out my review here. Here is one of my plaques from Rendi - LOVE it! Entry is easy, and open to residents of the US. 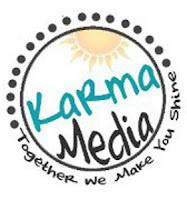 This giveaway is part of a review and giveaway tour with Karma Media. 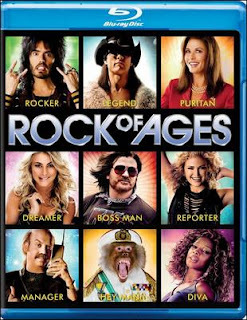 It has been a long time since a movie has become an instant favorite, but as the movie opened up and I saw Alec Baldwin singing, and doing a good job of it I might add, I fell in love with Rock Of Ages. I quickly realized the movie was a musical surrounding 80's big hair rock bands that showcases the likes of Tom Cruise, Alec Baldwin, Catherine Zeta Jones and Russell Brand singing their hearts out, and the movie just kept getting better! One of the most amazing things about this was the story-line which mimicked and flowed along with great musical hits from the 80's such as Paradise City, I Love Rock 'N Roll, Hit Me With Your Best Shot, Wanted Dead or Alive, Pour Some Sugar On Me, and SOOOO many more great hits. This movie gave these great songs a whole new meaning! The best part? Totally getting sucked into the movie and singing my heart out along with the actors. (I got to see a screening at home, so the only ones who complained about my singing were the kids, who were trying to watch a cartoon while I watched on my computer while wearing headphones.) Go on, I dare you to try to make it through the movie without singing along to the songs! Enough with the music (I need to push myself beyond that or we'll be here all night...), I loved it, and you will to - especially if you were a child of the 80's. The actors were amazing too. Who knew that Alec Baldwin and Tom Cruise could SING!! And both played such crazy and lovable characters. Ok, whoever thought to introduce us to Stacee Jaxx (Tom Cruise) while he is piled high with half naked women, and wearing some kind of jeweled dragon underwear really gave us quite the spectacle, one that won't easily be forgotten, but in that moment, it set the tone for this over-the-top crazy, fun, and HIGHLY entertaining movie. The Rocker (Lonnie): Russel Brand - Works at The Bourbon, loves Rock N Roll! The movie is really about one guy (Alec Baldwin) who has lived his life in Hollywood running the Bourbon Street bar. Enter a small-town girl with big-city singing dreams, and a city boy (can you hear the music to Journey's Don't Stop Believing here? 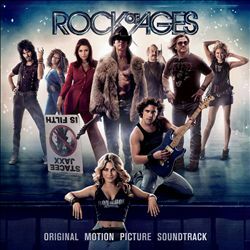 Only it is sung by Julianne Hough, Diego Boneta, Tom Cruise, Alec Baldwin, Russell Brand and Mary J. Blige) with big rock-n-roll dreams. He helps her get a job at the Bourbon after she is mugged, and sparks begin to fly. 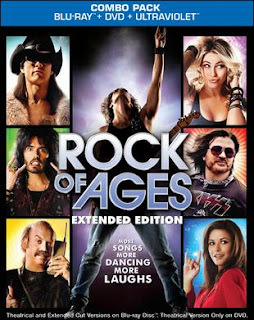 Enter Stacee Jaxx (Tom Cruise) who really steals the show as the rock legend who is breaking from the band to go solo. Apparently he and Dennis (Baldwin) go way back, and they have some crazy moments throughout the movie. The introduction of "Boy Bands" is briefly covered in a quite hilarious manner. Really, you don't want to miss this one. Update, a few days after watching the movie: I can't wait to get my hands on the movie and soundtrack! I've been singing the songs from the movie while out and about for the past few days, and I'm still amazed at what these great actors were able to pull off with this movie! They were fun and completely believable in their roles. Edition Reviewed: eScreener - I received online access to an eScreener to preview the movie, and will receive a copy of the movie and soundtrack in exchange for sharing the information about the movie and soundtrack here on Wendi's Book Corner! I am one of those people who loves professionally designed spaces, but who doesn't want to spend a fortune on a personal shopper and design team. After all, I'm a stay-at-home Mom and I prefer to spend our money on our family. I was really intrigued when I learned about a company called Rendi. Started by a woman named Annie Danielson, as a way to create jobs in her small town, the company has grown over the past 20+ years to what it has become today, a quality DIY home decor company that allows you to create your own items using their guides and options, you place your order, they create your keepsakes and send them to you, then you decorate! Rendi gives you the ability to customize your products to include any information you want to celebrate (family names, mottos, dates, special occasions, pictures, etc). Even better, they have wonderful ideas of pieces to put together (you can buy them as a collection and customize each piece), and special tools to help you hang your creations if you want to add depth or layer your pieces. I have created a very small family themed vignette from the Pattern Play Collection. My wall is not completely done yet as I still need to hang up my small black shelf, but I love what I've created in our entryway. It celebrates our family and allows me to spotlight fun family pictures. I am also planning to add a small black bow to the hanger for the B plaque. Another thing I love about Rendi, is that they also provide suggested sayings, and you can use theirs or come up with your own. I tweaked just about everything on mine and love what I came up with. I placed my order late on a weeknight, and had an email the next morning saying my order was already shipping! I had both pieces within two days! I was amazed!! I did contact their customer service about one piece that came damaged in shipping, and they sent out a replacement that afternoon! I've got a few more bare walls in my house, and I'm coming up with fun ideas for what I want to put there. Rendi products would also be great for a store (label your sections, provide ideas, showcase your favorite products), teacher gifts, customized wedding gifts, baby shower gifts, and so much more! Edition Reviewed: The Plaques shown above - I was provided a gift card to order products of my choice (I did spend a little extra to get exactly what I wanted) for this review in coordination with Karma Media. Rendi Cares: Rendi also supports Charity: Water, an organization dedicated to bringing clean drinkable water to those who don't have it. 100% of the proceeds from sales of their Dig It Frame go to digging water wells through Charity: Water. To date, 20 wells have been dug, each providing clean water to over 300 people. A few years ago, I was introduced to mineral makeup, and became a HUGE fan! I found it to blend well and work well with my skin. Additionally, as it is made from minerals, I feel great not putting a ton of chemicals onto my skin, and therefor into my person. 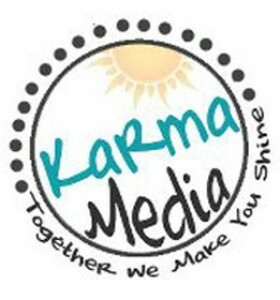 I was really excited when I got to try two eye shadows and a facial cleanser as part of a Karma Media Campaign, and I can't wait to tell you about my experience. So, I'll start with the cleanser. I have been using Mia Mariu's Refreshing Foaming Cleanser. It is primarily aloe and sea kelp, so it is gently, but still works. I'm loving it, but I should note it makes more of a lather than a foam, which is just fine for me. The description says it is good for all skin types, and that it is gentle enough for people with skin problems including rosacea. I also received two eye shadows (which they let me pick out), and I chose a sparkly blackish color called Azabache, and a warm pinky peach color called Durazno. I love both, and can do some pretty neat things with them when you combine dry and wet shadow together. I like to brush my entire eyelid with Durazno, then go back and darken the outer corner with Azabache, then use a wet liner brush and use the Azabache to line my lids. Sorry - the picture to the left is horrible, do you have any idea how hard it is to take a picture of your eye makeup with no one home to help out??? Well, the color is off, and my face looks funny, but I wanted to show you how nicely the mineral makeup blends. The next picture is a MUCH better representation of the beauty of these two colors. I am absolutely in love with these two colors and what I can accomplish with them. I put each color on dry with a medium brush, then took a liner brush and got it wet, doing a wet liner stroke at the inner edge of each color (so the wet liner lines are both in the middle, the dark on the bottom, the light on the top). Mia Mariu is a health and beauty company that focuses on keeping beauty products as natural as possible. They sell their products online and via home-based consultants. They have beauty products for your face, eyes and lips, skin care products, brushes, a line of nutritional products, and frangrances. One lucky reader will receive the same products that I reviewed, in your choice of colors (Foaming Cleanser, 2 Mineral Eye Shadows, choice of color). Enter now through 10/15 midnight EST, open to residents of the US.